Hello easiest recipe of life! Save on oven and stove top space by making this delicious holiday staple in the slow cooker. 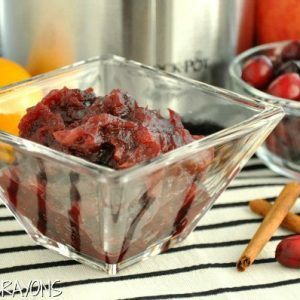 We love this crockpot cranberry sauce! Recipe yields 2 heaping cups of sauce and is easily doubled or tripled as needed! Grate the zest from your orange until you have about 1/2 teaspoon of zest, then slice and squeeze out 1/4 cup of juice. Add your zest and juice along with all the above ingredients into your slow cooker, cover, and cook for 2 hours on high or 3-4 hours on low. I made a point to stir it every so often, if only for the mere excuse of licking the the spoon and filling the house with the smell of amazing cinnamon apple cranberry deliciousness.